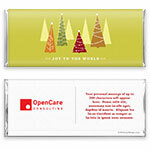 Celebrate the season in style with this fun and retro-inspired holiday wrapper. Design: Stylized Christmas trees with different decorations. Personalization: Front message, back logo and message.